Lively, fairful typical Islington haunt and clientele with with a range of well kept real ales and a relaxed, uplifting atmosphere. Bar staff were good eggs and the food was every bit as good as it was expensive. There are worse places for a man to spend a saturday evening. 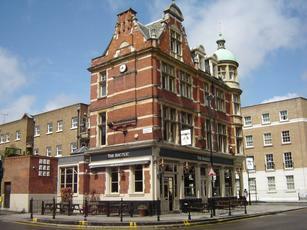 Bustling, renovated pub that has much to recommend it. Upmarket but laid back, friendly service, four ales including their "own" brewed by Sharps which surprised me by being delicious. Close relative to their rarely-seen Cornish Coaster. Two more Sharps but thankfully not the Doom. All taps either S&N (Heineken UK in modern parlance) or Molson. Maybe that's where the refit money came from. Great vibe and a few good ales on - Sharps Abbey Christmas was tasting good. Yes it's a bit trendy and not where to go if you want a traditional boozer but quite like it and offers something for most people. Quite a trendy sort of a place but with a nice atmosphere and interesting clientele. Nicely decked out. Couple of ales on when I went in. Previously known as The George and a proper boozer it was with decent beer and pub food. Now a "gastropub" ie not good enough to be a restaurant and ideas above its station as somewhere serving alcohol.